Paris Jackson went OFF on TMZ after the site reported that she attempted suicide by slitting both of her wrists early Saturday morning. According to their report, Paris did this in direct response to the Leaving Neverland documentary about her late father and his alleged victims of molestation. Interestingly, Paris has been vocal about NOT being vocal. She's said multiple times she would not be publicly defending her father's legacy because it's not her place and she knows he's innocent. TMZ originally reported that she was rushed to the hospital from her L.A. home around 7:30A, then placed on a 5150 hold. She was released hours later. Paris was seen heading back to her home later Sunday as she took to Twitter to call the reports lies. The Blast also says they have the audio of the 9-1-1 call where dispathers believed there was a "psychiatric problem." Both sites are sticking to their stories. Paris was later seen on a movie date at Universal City with her boyfriend (pictured above and below) Gabriel Glenn, and the site says she was released despite the hold because Paris said her attorneys were taking her to rehab. She reportedly never went. Despite some of the Jackson family rushing to her defense on social media, TMZ now reports her family is urging her to go to rehab. Since she's almost 21, though, no one can force her. Sources familiar with the situation tell TMZ ... those close to Paris suggested rehab after what law enforcement says was a suicide attempt over the weekend, landing her in the hospital. We're told the attempted suicide shows some serious underlying problems ... they say Paris is dealing with all sorts of emotional issues as well as substance abuse issues. Our sources say Paris' team had help ready to spring into action Sunday, but she refused. 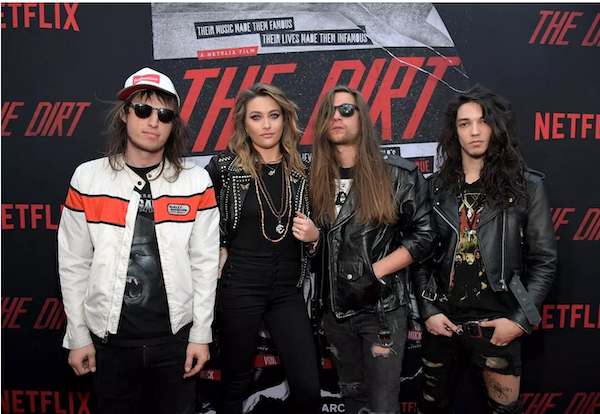 We do hope Paris is OK.
She looked to be in good spirits at last night's Hollywood premiere of the Mötley Crüe biopic, The Dirt.